Card Members can earn 1 Membership Rewards point for every eligible Hong Kong dollar business spend3 on the Corporate Card. These points have no expiry date and are redeemable for air travel and hotel stays, as well as shopping, home and recreation items. With enrollment, Corporate Express Cash5 allows employees access to cash for travel emergencies and incidentals at over 600,000 ATMs worldwide. Receive additional coverage with the Gold Card’s insurance for baggage and personal possessions. Baggage that is lost, damaged or stolen whilst on business travel with a common carrier will be reimbursed up to HK$40,000. 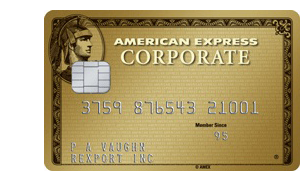 The Corporate Gold Card guarantees protection against fraudulent transactions on your Card, provided responsible care has been taken and as long as we are notified immediately8 after discovery of any fraudulent transactions, in compliance with Card Terms and Conditions. American Express SafeKey further enhances online transaction security with added security measure to safeguard your online purchases. With the option to convert and bill all charges in a single currency, you can gain more control over the cost of foreign exchange. Potential processing costs and foreign exchange charges associated with international payments can be reduced.